While poet is not a word usually used to describe Washington, a visit to an exhibition at the Wadsworth Atheneum Museum of Art in Hartford, Connecticut, suggests Washington was gifted in expressing his romantic sentiments through verse. In the exhibition, a painting by Rockwell Kent and sculpture by Daniel Chester French are paired (predictably) with verses by Robert Frost and Walt Whitman. The walls are painted a soft grey with generous space allotted between each object and its curated verse. The space allows the viewer to appreciate each new composition of word and art. 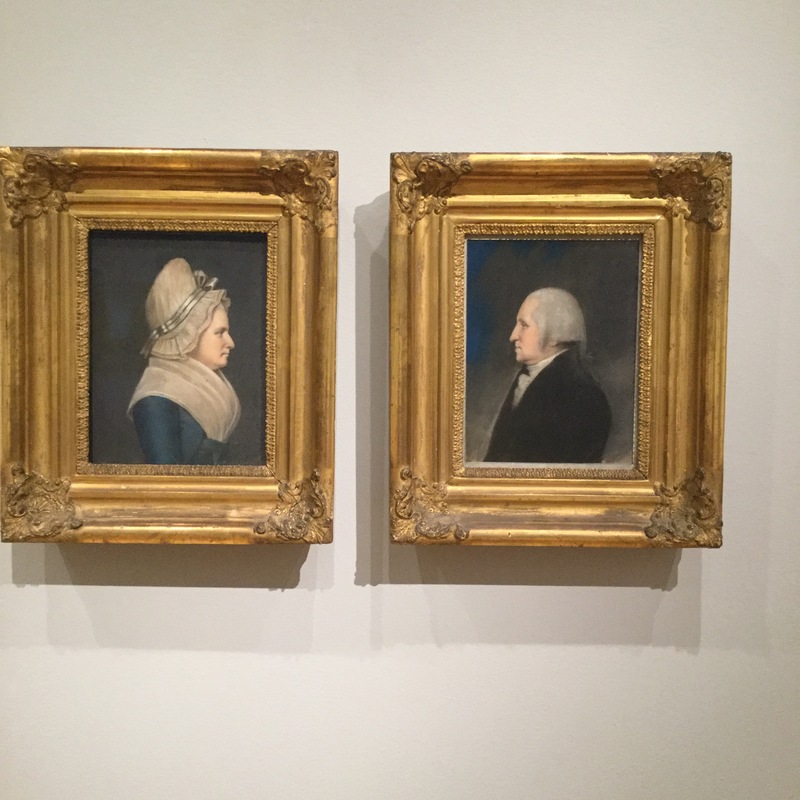 On one wall, the portraits of Martha (left) and George Washington (right) are placed so they appear to be gazing at each other. Moreover, at first glance, the poem appears to be a a expression of George’s love for Martha. However, the note above Washington’s verse explains the sentiment was taken from a personal letter 1749-50, nine years before he married Martha. The text next to the portraits -painted by James Sharples (1798)- explains that at the time the letter was written, Washington was a “lovesick teenager” who “penned a passionate sentimental verse to an unknown maiden” before he served as Commander-in-Chief of the Continental Army. Historians suggest that young Washington had crushed on several young women including Sally Fairfax, the wife of a friend. Regardless, the evidence that Washington had dabbled in romantic poetry in addition to the genres of letter-writing and speeches, speaks to his early comfort with expressing himself with the written word. But Washington’s conceit, or extended metaphor, does reveal his sophistication in convincing the maiden the depth and sincerity of his affections. On January 6, 1759, Washington, age 27, married the wealthy widow Martha Dandridge Custis, age 28 years old. According to historians, their marriage was successful, and the union increased Washington’s property holdings and social standing. He acquired a portion of the Custis estate upon his marriage, worth about $100,000 at the time. Although he and Martha never had children of their own, he cared for Martha’s two children from her previous marriage. On this extended weekend (2/13-2/15/16) , one that combines Valentine’s Day with President’s Day, we have yet one more reason to celebrate George Washington, our first President, and our first Poet-in-Chief. Never would have imagined George Washington writing love poems to his “crush”! I know! Makes him a little less “Father of the Nation” and more “Man of the Moment”! I saw this exhibit a couple weeks ago and really enjoyed the combination of poetry and art. I remember being quite taken with George Washington’s poem! I also loved the bassinet/cradle carved from the Charter Oak for the Colts. It was incredible. Yes, the cradle was amazing, and the poem was obviously connected. I was surprised that there was no connection to Alexander Pope’s verse: Tis not enough no harshness gives offence,/The sound must seem an echo to the sense. Especially since they used this line for the exhibition’s title. Very interesting! It’s cool learning about the different sides of our country’s founding fathers (I have been a little obsessed with the musical Hamilton since it came out, in which George Washington is one of the characters). Thanks for sharing! Thanks for taking time to respond….